Today concludes the sampling on the first leg of the OSTRICH 2015 cruise. While we steam north back up the Keys toward Miami, the science party is busy backing up hard drives, organizing eddy imagery, updating blog posts (in my case), and making a list of everything that needs to be accomplished while docked at RSMAS tomorrow. But after a whirlwind 5 days of round-the-clock sampling, we finally have some free time to enjoy the sunset, celebrate a birthday (Happy Birthday Cammie! ), and view the magnificent sky full of stars [as we steam east, away from the light pollution of Miami, into a comforting blanket of darkness]. What have we been doing over the last 5 days? Perhaps our sampling plan schematic (left) will clear it up… just kidding; I’ll break is down for you. We have been sampling inside, at the edge, and outside the eddy at different regions of the eddy (i.e. inshore, offshore) using a suite of sampling gear (explained later). But, as mentioned in a previous post, this eddy is disintegrating, thus some of the edges are not very defined. What we do know is we have been sampling water masses that were recently eddy-associated, so the plankton and larval fish sampled there have hypothetically been in eddy-waters for the past week or so. We hope that the data and samples we collect will show differences in the density and composition of plankton and larval fish associated with these water masses. We’ve been using a few different pieces of sampling gear to not only collect and image the plankton and larval fish, but also learn about the water temperature, salinity, oxygen content, and phytoplankton abundance associated with the plankton we collect. Looking at the sampling schematic (left) again, you will see long red lines, with a collection of colored dots at the end. The red line indicates that we towed the DPI-2 (formerly ISIIS) across the eddy, collecting simultaneously thousands of gigabytes of plankton images (see examples) and real-time water temperature, salinity, oxygen, and fluorescence (an indicator of phytoplankton abundance) data. The dots at the end of the DPI-2 transect, indicate 4-m2 and 1-m2 MOCNESS tows inside, on the edge, and outside the eddy. Since the MOCNESS has multiple nets that are triggered to open and close while in the water, we were able to sample a number of discrete depths with one tow. The 4-m2 MOCNESS (or MOC4 as we fondly refer to it) collects the larval fish and larger zooplankton, while the 1-m2 MOCNESS (or MOC1) collects smaller zooplankton including thousands of tiny copepods, about the size of the point of a pen. The last piece of gear put in the water in each eddy region is called the CTD (see cover picture). 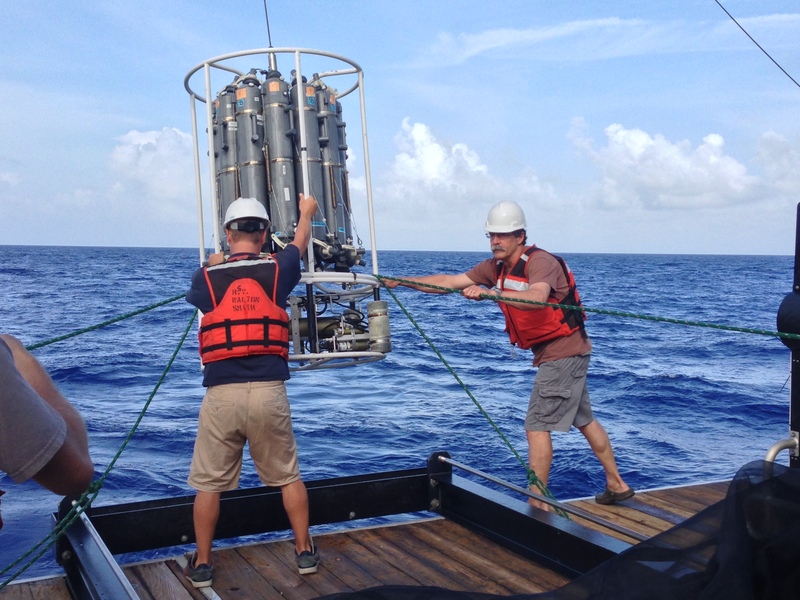 CTD stands for Conductivity (which measures salinity), Temperature, and Depth. The CTD sits within a large frame holding a rosette of Niskin bottles. These are elongated, plastic bottles that are open on both ends. When the CTD goes into the water, the Niskin bottles are open. Individual bottles are then triggered by an operator on the ship to close at different depths. This gives us the ability to sample the water column at a specific depth. We use these water samples to collect phytoplankton, the microscopic algae that are at the base of the food web in the ocean. Coupled with the DPI-2 data, and MOCNESS samples, we can use this information to see if there is a difference in phytoplankton abundance and composition in the different water masses of the disintegrating eddy. In order to sample this eddy round-the-clock for the past 5 days, we divided our science team into a day (4am-4pm) and night (4pm-4am) shift. But in reality, we are all working more like 14-18+ hour days. All our hard work has amounted to 186 1L jars of plankton samples, 35 2TB hard drives of DPI-2 data, and 112 phytoplankton samples. This sounds as productive as it felt, and we are now enjoying some well deserved free-time on this beautiful evening as we steam back to Miami.